Anyone do any kayak fishing around Lanark Reef near Carabelle, Florida? NO BUT RECENTLY FISHED RATTLESNAKE COVE ON BAY SIDE OF ST GEORGE ISLAND STATE PARK. Welcome to the Hobie Forum. Not yet with the yak, but I have done a lot of boat fishing out of Lanark with a buddy. That is his favorite place to launch. On Sunday...I paddled a rented "Revolution" to the Dog Island side of Lanark Reef. Talked to another yaker who had just landed an 18" red. Think I'll give it a try tomorrow, although the rental yak is plane ant not really rigged for fishing. How did the Revo paddle? I rented the new outback sat., took it to lake talquin, it performed nicely, very manuverable, quick, extremely stable. It isn't something you want to have to paddle for any distance. 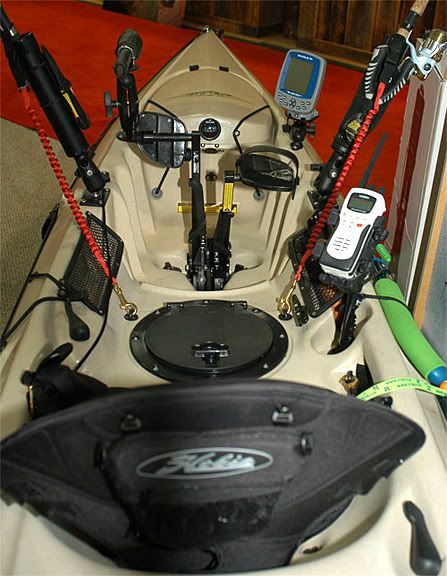 Being new to kayaking I realize now that a drift bag or drift chain would help considerably when fishing. I plan to rent the revo next and then decide on which to purchase. I have been told that Hobie was working with the RAM people on designing a rod holder that would attach forward of the seat area on the REvo. THis would help in my decesion making if so. I am new to kayaking so you need to take my opinions with that in mind. I found the Revolution paddled well. I launched at Lanark Boat Club and paddled around Lanark Reef on four consecutive days and paddled the entire way. Met another fisherman one day out and let him try the peddle drive which he loved. On the fourth day I did some fishing and used the peddle drive while fishing which worked fine. My wife used the kayak for about an hour and also liked the peddle drive. I plan on installing outriggers via the ram rocket launcher rod holders to add stand up stability for fly fishing, poling. Where would be the optimum position relative to the seat to facilitate this? Here is a pic that Matt Miller posted earlier of a fully rigged Revo (see dueitt's link above for other pics). You will note the RAM rocket launcher 2x3 mounts just forward of the mesh pockets. This looks like a good spot to consider installiing the RAM outriggers, assuming in-the-hull access for installing backing plates. But Hobie now has its own outriggers (amas), and I seem to recall that these can be installed behind the seat. You probably need to check with a dealer to confirm this, and to see what Hobie recommends. This set up would probably best for poling but not so good for paddling? Whereas behing the seat would be best for paddling but not so good for poling? Whatcha think? To tell ya the truth, I have done it both ways. Behind the seat on my Outback, and forward on the Sport. Either way will work so long as you have sufficient space for your normal paddle stroke. You will still whack your float or arm with your paddle on occasion, but hey, as Doc Wilki sez, "we don't need no steenking paddles" anyhow, or words to that effect! Apalach- Is the standup stability the same in both locations? Yep--doesn't seem to make much, if any, difference in that regard. Apalach- the ram ball needs to be bolted with nut on underside along with a metal plate on the underside for additional sturdiness does it not? Do you think thats doable based on the "fitted out" photo? If so I would presume that one would have to go throught the 8" hatch between your legs? Apalach- the ram ball needs to be bolted with nut on underside along with a metal plate on the underside for additional sturdiness does it not? Correct. At first I thought it might be accessible thru the front hatch, but I think you're right. It would probably have to be the 8 incher just in front of the seat. These installs always involve a bit of being a contortionist, but it looks doable to me. Maybe one of the new owners can chime in here on this. I have been getting good feedback about the new Hobie Sidekick amas as well, so that would certainly be something else to consider. I believe these would bolt on just behnd the seat.